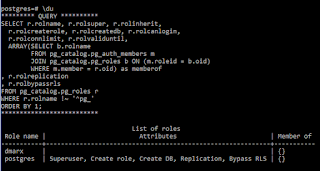 The command-line based "PostgreSQL interactive terminal" known as psql is handy for manipulating and accessing data in a PostgreSQL database. Because of its command-line nature, psql is particularly well suited for use in scripts. One of the psql features that makes it even more useful in scripting contexts is its support for "meta-commands". As the psql documentation states, "Anything you enter in psql that begins with an unquoted backslash is a psql meta-command that" and "these commands make psql more useful for administration or scripting." When writing psql scripts, it is often preferable to set some variables locally for the time period the script is being run, but might also be desirable to not change these variables permanently for the psql session if it's likely that other scripts or other work will be performed from the psql session after the script's conclusion. In this post, I will demonstrate use of psql's \set meta-command to temporarily store off previous settings of variables to restore these settings at the script's conclusion. The psql documentation describes "a number of ... variables [that] are treated specially by psql." These "specially treated variables" are the ones that we most likely want to ensure that we set for our script's duration only and the restore their previously set values upon script exit. The documentation describes these "specially treated variables": "They represent certain option settings that can be changed at run time by altering the value of the variable, or in some cases represent changeable state of psql. By convention, all specially treated variables' names consist of all upper-case ASCII letters (and possibly digits and underscores). To ensure maximum compatibility in the future, avoid using such variable names for your own purposes." Examples of these "specially treated variables" include AUTOCOMMIT, ECHO, ECHO_HIDDEN, PROMPT1, PROMPT2, PROMPT3, and VERBOSE, but there are many more. For demonstration purposes, let's suppose you want to set the ECHO variable to something other than its default (none). For our purposes, we'll set ECHO to queries. We want to make sure, however, that we set it back to whatever it was when our script was called before leaving the script. The following simple psql logic accomplishes this. It's as simple as that to temporarily set "specially treated variables" for your script's convenience without permanently changing the settings for the caller who might be running your script in the same psql session. The key things to remember are that the \set meta-command is always all lowercase, the specially treated variables have names that are always all uppercase but the specially treated variable values do not need to be uppercase (and typically are not), and the values in a variable can be accessed by prefixing the variable name with a colon (:). 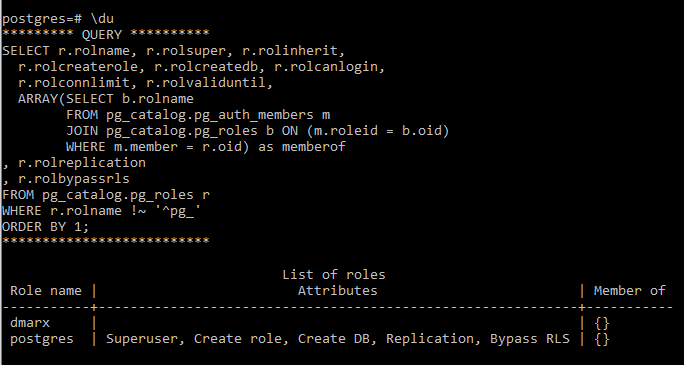 It is easy for someone who is new to PostgreSQL and who uses PostgreSQL's terminal editor psql to confuse the commands \set and SET. This post contrasts these commands and provides a brief overview of other commands that include the word "set". The easiest way to remember how to differentiate \set from SET is to keep in mind that the "backslash commands" such as \set are "meta commands" for the command-line psql tool and do not mean anything to the PostgreSQL database itself. The SET command, which lacks a backslash, is a PostgreSQL database command that happens to be executed against the database from the psql command-line client. I prefer to use all uppercase letters for SET to more clearly differentiate from /set. Two variables with same letters but different cases are two distinct variables. \set displays all variables when no arguments are provided to it. Any case variation (even sHoW aLl;) works. Any case variation of command and/or variable name also works. There are two more psql meta commands that that "set" things and include the name "set". The \pset met command configures how psql presents "query result tables." Like \set, \pset can be specified without argument to see all of the current presentation settings. Unlike the psql meta commands \set and \pset, the \gset psql metacommand does affect the PostgreSQL server because \gset submits the query buffer to the server and then stores the output returned from the server into specified psql variables. I discussed \gset with a few additional details in the blog post "Setting PostgreSQL psql Variable Based Upon Query Result." Although \set and SET can be used to set variables, the easiest way to distinguish between them is to consider that the backslash commands such as \set are psql commands (and so \pset sets variables in the psql client tool) and commands without the backslash such as SET are PostgreSQL commands sent to the server from psql or from any other client (but ultimately set variables on the server). Nicolas Fränkel recently published a survey of command-line tools delivered with OpenJDK 11 in the blog post "OpenJDK 11, tools of the trade." In that post, he briefly summarizes the tools jps (a JVM process status tool), jinfo (JVM configuration details), jmap (classes/objects on the heap), jstack (thread analysis), and graphical tool JConsole (monitor Java applications). All of these tools are handy for Java developers to be aware of to apply as needed and Fränkel's post provides a nice introductory overview for those new to these tools. In recent years, I've moved toward applying the single jcmd tool instead of most of the other command-line tools (though it doesn't replace graphical tool JConsole in any way) as I've discussed in the post "jcmd: One JDK Command-Line Tool to Rule Them All." Whether to use jcmd or one of the individual tools largely comes down to individual taste and preferences. Those who are already experienced with existing individual tools may prefer the more direct approach of those tools while those not familiar with the individual tools may prefer the interactive ability provided by jcmd for determining what tools and options are available. I certainly prefer non-experimental tools over "experimental" tools, but many of these tools have been labeled "experimental" for many versions of the JDK and are still with us. The previously mentioned blog post "jcmd: One JDK Command-Line Tool to Rule Them All" describes how to use jcmd's interactive features to identify its capabilities supported for various JVM processes. There is a table toward the end of that post that "maps" jcmd options to some of the corresponding individual tools' commands and options. I reproduce that here for convenience. The jcmd tool continues to be enhanced. JDK 9 saw several enhancements to jcmd via JEP 228 ("Add More Diagnostic Commands"). In JDK 11, support for displaying classloader hierarchies was added to jcmd. Here is a simple screen snapshot of that support for classloaders hierarchies in action. As Fränkel concludes in his post, "The JDK offers a lot of out-of-box tools to help developers" and "they are a huge asset in a developer’s day-to-day job." This sentiment applies whether one chooses to use the individual JDK-provided tools or chooses to use jcmd.